It is likely that this bottle belongs to a small group of bottles produced in a Guangzhou studio for the court during the late Qianlong/Jiaqing periods. For similar bottles that also bear the distinctive 'Chinese hat' motif, see Moss, Graham, Tsang, A Treasury of Chinese Snuff Bottles. The Mary and George Bloch Collection , Hong Kong, 1998, vol. 3, no. 393, Moss, Graham and Tsang, The Art of the Chinese Snuff Bottle, The J & J Collection, New York, 1993, no. 347, and Holden, Rivers and Mountains Far From The World, Hong Kong, 1994, no 4. 1760-1820, of compressed form, with a flat lip the body carved with leafy vines and double gourds, supported by three double gourds at the foot, the stone with an even greenish cast. 19th century. The pear-shaped bottle carved in low relief with two mythical beasts, the reverse with archaistic dragons formed into a stylised character, flanked with beast mask handles. The ink stone is Chinese in origin and is used in calligraphy and painting. Extant ink stones date from early antiquity in China. The device evolved from a rubbing tool used for rubbing dyes dating around 6000 to 7000 years ago. The earliest excavated ink stone is dated from the 3rd century BC, and was discovered in a tomb located in modern Yun Meng, Hubei. 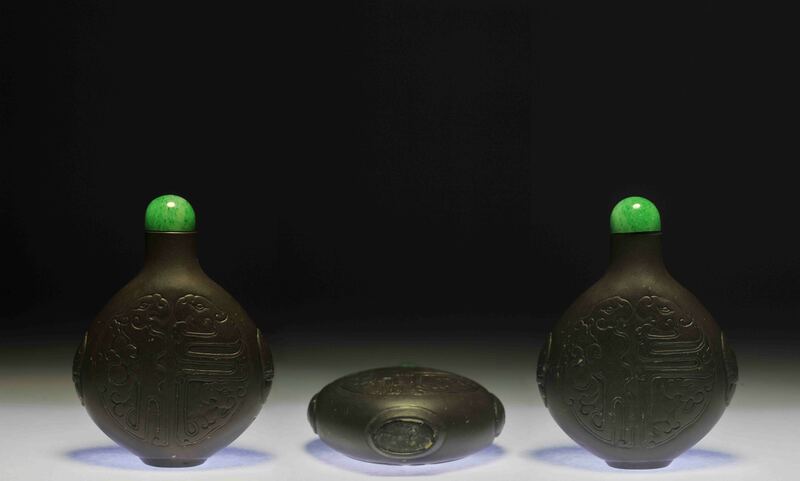 Usage of the ink stone was popularized during the Han Dynasty. Stimulated by the social economy and culture, the demand for ink stones increased during the Tang Dynasty (618-905) and reached its height in the Song Dynasty (960–1279). Song Dynasty ink stones can be of great size and often display a delicacy of carving. Song Dynasty ink stones can also exhibit a roughness in their finishing. Dragon designs of the period often reveal an almost humorous rendition; the dragons often seem to smile. From the subsequent Yuan Dynasty, in contrast, dragons display a ferocious appearance. The Qian Long Emperor had his own imperial collection of ink stones catalogued into a twenty-four chapter compendium entitled Xi Qing Yan Pu. Many of these ink stones are housed in the National Palace Museum collection in Taipei. Books and scholarship on the various ink stones of China existed chiefly in Japan, where a long bibliography on the subject exists. Ink stones should be appreciated in the context of the traditional scholar's studio culture and the appreciation of furnishings, antiques, paper, seals and all other associated objects. Members of the Chinese literati, such as the Song Dynasty's Ouyang Xiu, contributed greatly to this new culture. For serious calligraphers and painters, a good ink stone is as important as the quality of the ink. An ink stone will affect the quality and texture of the ink that is ground upon it. Four kinds of Chinese ink stones are especially noted in ink stone art history and are popularly known as the "Four Famous Ink stones". 1. Duan ink stones (端砚) are produced in Zhao Qing, Guang Dong Province, and got its name from Duan Prefecture that governed the city during the Tang Dynasty. Duan stone is a volcanic tuff, commonly of a purple to a purple-red color. There are various distinctive markings, due to various rock materials imbedded in the stone, that create unique designs and stone eyes (inclusions) which were traditionally valued in China. A green variety of the stone was mined in the Song Dynasty. Duan ink stones are carefully categorized by the mines (Keng) from which the raw stone was excavated. Mines were open only for discrete periods in history. For example, the Ma Zu Keng mine was originally opened in the Qian Long reign (1736-1795), although reopened in modern times. 2. She ink stones (歙砚) come from She County (An Hui Province) and Wu Yuan County (Jiang Xi Province). Both counties were under jurisdiction of the ancient She Prefecture of Hui Zhou during the Tang Dynasty when the She ink stone was first made. This stone is a variety of slate and like Duan stone is categorized by the various mines from which the stone was obtained historically. It has a black color and displays a variety of gold-like markings. She ink stones were first used during the Tang Dynasty. 3. Tao(He) ink stones (洮(河)砚) are made from the stones found at the bottom of the Tao River in Gan Su Province. 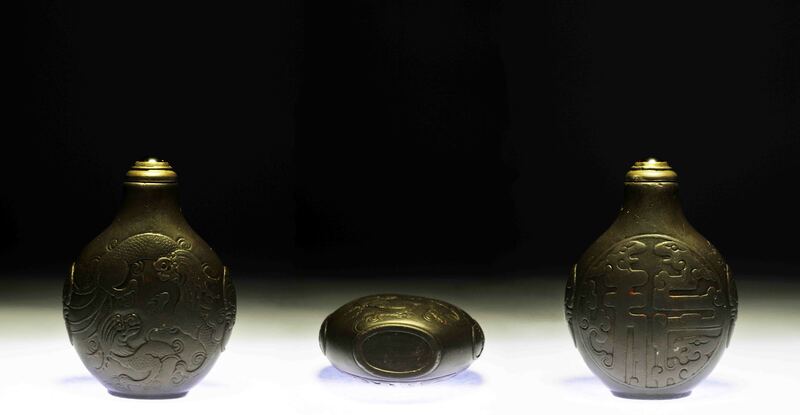 These ink stones were first used during the Song Dynasty and became rapidly desired. It bears distinct markings such as bands of ripples with varying shades. The stone is crystalline and looks like jade. These stones have become increasingly rare and are difficult to find. It can easily be confused with a green Duan stone, but can be distinguished by its crystalline nature. 4. Cheng Ni ink stones (澄泥砚) are ceramic-manufactured ink stones. 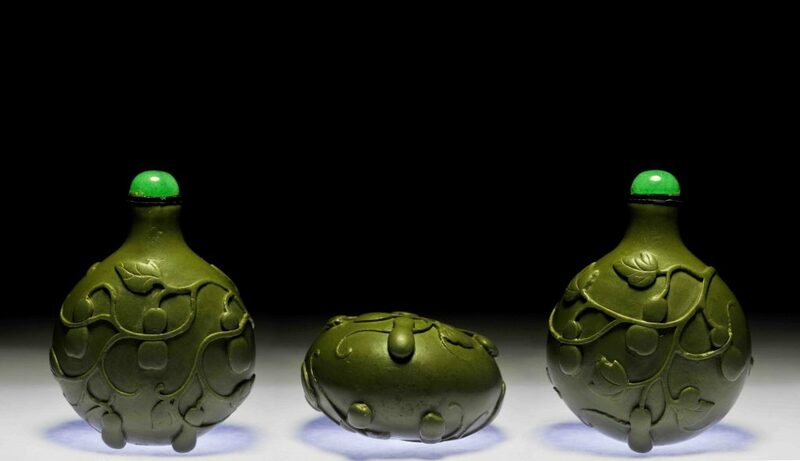 This process began in the Tang Dynasty and is said to have originated in Luo Yang, Henan.